Le courage, c’est de chercher la vérité et de la dire | One quality, the finest. When I was a student in Tours, the teacher who gave us an orientation visit around the city told us that virtually every city and town in France had a square or street named after French Socialist leader Jean Jaurès, just like the square in front of the Mairie (City Hall) where we were standing. I found that this is true; in fact, in the 1976 film Maîtresse (“Mistress”), one of the characters wails, “There are too many avenues named after Jean Jaurès” while looking at a Parisian map. There are even streets named after him in other parts of Europe, Israel, and South America. One of my favorite singers, Jacques Brel, wrote a song dedicated to him. But who was Jean Jaurès? Jaurès was born on September 3, 1859 to a bourgeois family of modest means. Several members of his family achieved the rank of Admiral in the Navy; his cousin was even the Minister of the Navy. This is particularly ironic because Jaurès was staunchly anti-military. Jaurès was a brilliant student of philosophy at the École normale supérieure in Paris. He taught for a few years before entering politics, where his talents as a passionate orator made him enormously effective. 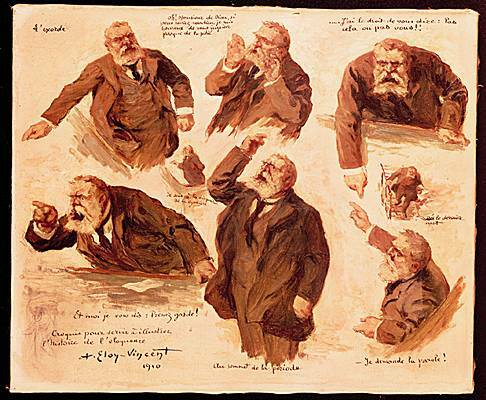 Jaurès aligned himself with worker’s rights issues, such as the miners’ strike of Carmaux. Along with Zola, he staunchly defended Alfred Dreyfus. He became the leader of the French Socialist Party in 1902. His party merged with another to become the French Section of the Worker’s International in 1905. Jaurès supported the important legislation in 1905 that separated church and state. He also supported the teaching of regional languages in the schools, such as Breton and Occitan. He opposed the draft and tried to organize general strikes in France and Germany as a bid to force the governments back to the bargaining table. Jaurès was assassinated at a Paris café at the beginning of World War I on July 31, 1914. His remains are in the Panthéon, the home of France’s heroes. Today’s expression is a Jaurès quotation, “Le courage, c’est de chercher la vérité et de la dire” (luh koorazj, seh duh shareshay lah vare-e-tay ay duh lah deer), which means “Courage, it’s to search for the truth and to say it.” So, the next time you see a street, square, park, or subway stop named after Jean Jaurès, think of courage that is so great that someone died for his convictions. This entry was posted in People and tagged Alfred Dreyfus, Carmaux, French politician, Jacques Brel, Jean Jaurès, Le courage c’est de chercher la vérité et de la dire, Socialists. Bookmark the permalink. What a great man. If he hadn’t been killed he might have averted WWI and therefore WWII. On that single thread dangled the fate of the world, and some insane idiot snapped it.